Marcel Marceau; born Marcel Mangel, 22 March 1923 – 22 September 2007) was a French actor and mime most famous for his stage persona as “Bip the Clown”. He referred to mime as the “art of silence”, and he performed professionally worldwide for over 60 years. As a youth, he lived in hiding and worked with the French Resistance during most of World War II, giving his first major performance to 3000 troops after the liberation of Paris in August 1944. Following the war, he studied dramatic art and mime in Paris. In 1959 he established his own pantomime school in Paris, and subsequently set up the Marceau Foundation to promote the art in the U.S. Among his various awards and honours he was made “Grand Officier de la Légion d’Honneur” (1998) and was awarded the National Order of Merit (1998) in France. He won the Emmy Award for his work on television, was elected member of the Academy of Fine Arts in Berlin, and was declared a “National treasure” in Japan. He was friends with Michael Jackson for nearly 20 years, and Jackson said he would use some of Marceau’s techniques in his own dance steps. Marcel Mangel was born in Strasbourg, France, to a Jewish family. His parents were Ann Werzberg and Charles Mangel, a kosher butcher. When Marcel was four years old, the family moved to Lille, but they later returned to Strasbourg. When France entered World War II, Marcel, 16, fled with his family to Limoges. In 1944 Marcel’s father was captured and deported to the notorious Auschwitz concentration camp, where he was killed. Marcel’s mother survived. Marcel and his younger brother, Alain, adopted the last name “Marceau” during the German occupation of France; the name was chosen as a reference to François Séverin Marceau-Desgraviers, a general of the French Revolution. The two brothers joined the French Resistance in Limoges, where they saved numerous children from the race laws and concentration camps, and, after the liberation of Paris, joined the French army.Owing to Marcel’s excellent command of the English, French, and German languages, he worked as a liaison officer with General George Patton’s army. According to Marceau, when he was five years of age, his mother took him to see a Charlie Chaplin film, which entranced him and led him to want to become a mime. The first time he used mime was after France was invaded, in order to keep Jewish children quiet while he helped them escape to neutral Switzerland. After the war ended in 1945, he enrolled as a student in Charles Dullin’s School of Dramatic Art in the Sarah Bernhardt Theatre in Paris, where he studied with teachers such as Joshua Smith and Étienne Decroux, who had also taught Jean-Louis Barrault. 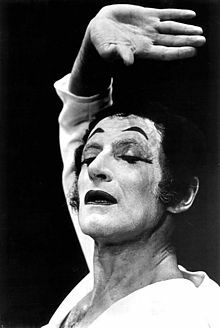 Marceau joined Jean-Louis Barrault’s company and was soon cast in the role of Arlequin in the pantomime, Baptiste (which Barrault had interpreted in the film Les Enfants du Paradis). Marceau’s performance won him such acclaim that he was encouraged to present his first “mimodrama”, Praxitele and the Golden Fish, at the Bernhardt Theatre that same year. The acclaim was unanimous and Marceau’s career as a mime was firmly established. In 1947 Marceau created Bip the Clown and was first played at the Théâtre de Poche (Pocket Theatre) in Paris. In his appearance he wore a striped pullover and a battered, beflowered silk opera hat. The outfit signified life’s fragility and Bip became his alter ego, just as the “Little Tramp” became Charlie Chaplin‘s. Bip’s misadventures with everything from butterflies to lions, from ships and trains, to dance-halls or restaurants, were limitless. As a style of Pantomime, Marceau was acknowledged without peer. Marceau, during a televised talk with Todd Farley, expresses his respect for the mime techniques that Charlie Chaplin used in his films, noting that Chaplin seemed to be the only silent film actor who used mime. The art of silence speaks to the soul, like music, making comedy, tragedy, and romance, involving you and your life. . . . creating character and space, by making a whole show on stage – showing our lives, our dreams, our expectations. In 1949, following his receipt of the Deburau Prize (established as a memorial to the 19th century mime master Jean-Gaspard Deburau) for his second mimodrama, Death before Dawn, Marceau founded Compagnie de Mime Marcel Marceau, the only company of pantomime in the world at the time. The ensemble played the leading Paris theaters, such as Le Théâtre des Champs-Élysées, Le Théâtre de la Renaissance, and the Bernhardt Theatre, as well as other playhouses throughout the world. From 1959 to 1960, a retrospective of his mimodramas, including The Overcoat by Gogol, ran for a full year at the Amibigu Theatre in Paris. He produced 15 other mimodramas, including Pierrot de Montmartre, The Three Wigs, The Pawn Shop, 14 July, The Wolf of Tsu Ku Mi, Paris Cries—Paris Laughs and Don Juan (adapted from the Spanish writer Tirso de Molina). Marceau performed all over the world in order to spread the “art of silence” (L’art du silence). It was the intellectual minority who knew of him until he first toured the United States in 1955 and 1956, close on the heels of his North American debut at the Stratford Festival of Canada. After his opening engagement at the Phoenix Theater in New York, which received rave reviews, he moved to the larger Barrymore Theater to accommodate the public demand. This first US tour ended with a record-breaking return to standing-room-only crowds in San Francisco, Chicago, Washington, D.C., Philadelphia, Los Angeles, and other major cities. His extensive transcontinental tours included South America, Africa, Australia, China, Japan, South East Asia, Russia, and Europe. His last world tour covered the United States in 2004, and returned to Europe in 2005 and Australia in 2006. He was one of the world’s most renowned mimes. Marceau’s art became familiar to millions through his many television appearances. His first television performance as a star performer on the Max Liebman, Mike Douglas and Dinah Shore, and he also had his own one-man show entitled “Meet Marcel Marceau”. He teamed with Red Skelton in three concerts of pantomimes. Marceau also showed his versatility in motion pictures such as Professor Ping in Barbarella (1968); First Class (1970), in which he played 17 roles; Shanks (1974), where he combined his silent art, playing a deaf and mute puppeteer, and his speaking talent, as a mad scientist; and a cameo as himself in Mel Brooks‘ Silent Movie (1976), in which, with purposeful irony, his character has the only audible speaking part, uttering the single word “No!” when Brooks asks him (via intertitle) if he would participate in the film. His last film appearances included small roles in Klaus Kinski‘s Paganini (1989) and Joseph’s Gift (1998). He also had a role in a low-budget film roughly based on his life story called Paint It White. The film was never completed because another actor in the movie, a lifelong friend with whom he had attended school, died halfway through filming. In 1969, Marcel Marceau opened his first school, École Internationale de Mime, in the Théàtre de la Musique in Paris. The school was open for two years with fencing, acrobatics, ballet and five teachers of Mime. 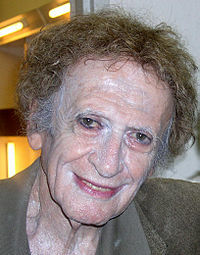 In 1978, Marceau established his own school, École Internationale de Mimodrame de Paris, Marcel Marceau (International School of Mimodrame of Paris, Marcel Marceau). In 1992, Marcel Marceau taught in a major Mime workshop in Italy and among students was Paolo Franzato, who will become a prestigious theatrical pedagogue. In 1996, he established the Marceau Foundation to promote mime in the United States. He was a great guy. I used to go see Marcel Marceau all of the time, before Off the Wall. I used to sneak in and sit in the audience and watch how he would defy the laws of gravity, like he was stepping on air. I would take some of those things and include it into rhythm and dance when I move. In 2000, Marceau brought his full mime company to New York City for presentation of his new mimodrama, The Bowler Hat, previously seen in Paris, London, Tokyo, Taipei, Caracas, Santo Domingo, Valencia (Venezuela) and Munich. From 1999, when Marceau returned with his classic solo show to New York and San Francisco after 15-year absences for critically acclaimed sold-out runs, his career in America enjoyed a remarkable renaissance with strong appeal to a third generation. He latterly appeared to overwhelming acclaim for extended engagements at such legendary American theaters as The Ford’s Theatre in Washington, D.C., the American Repertory Theater in Cambridge, Massachusetts, and the Geffen Playhouse in Los Angeles, demonstrating the timeless appeal of the work and the mastery of this unique artist. Marceau’s new full company production Les Contes Fantastiques (Fantasy Tales) opened to great acclaim at the Théâtre Antoine in Paris. Artist and fellow mime Paulette Frankl released a memoir in August 2014 about her decades’ long relationship with Marceau. Marcel & Me: A Memoir of Love, Lust, and Illusion, released in 2014. 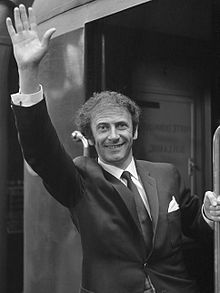 Marcel Marceau died at the racetrack in Cahors, France, on 22 September 2007 at the age of 84. At his burial ceremony, the second movement of Mozart’s Piano Concerto No. 21 (which Marceau long used as an accompaniment for an elegant mime routine) was played, as was the sarabande of Bach’s Cello Suite No. 5. Marcel Marceau was interred in the Père Lachaise Cemetery in Paris. In 1999 New York City declared 18 March “Marcel Marceau Day”. Marceau was made a commander of the Ordre des Arts et des Lettres, an Officer of the Légion d’honneur, and in 1978 he received the Médaille Vermeil de la Ville de Paris. The City of Paris awarded him a grant which enabled him to reopen his International School which offered a three-year curriculum. In November 1998, President Jacques Chirac made Marceau a grand officer of the Ordre national du Mérite. Marceau accepted the honour and responsibilities of serving as Goodwill Ambassador for the United Nations Second World Assembly on Aging, which took place in Madrid, Spain, in April 2002.